Remove any rind or fat from the steak, then slice thinly. Tenderize by bashing them with a cleaver or meat hammer, creating a large surface area for quick cooking. Mix all the marinade ingredients with the meat. Massage the marinade into the meat, marinade for 30 minutes, or overnight for more flavour. Heat 2 tablespoons vegetable oil in a wok to high heat. Sear your meat for a couple of minutes on each side and set aside. Add oil to the wok and when smoking hot, add the ginger and spring onions, once they have slightly softened, add the pepper and onions. 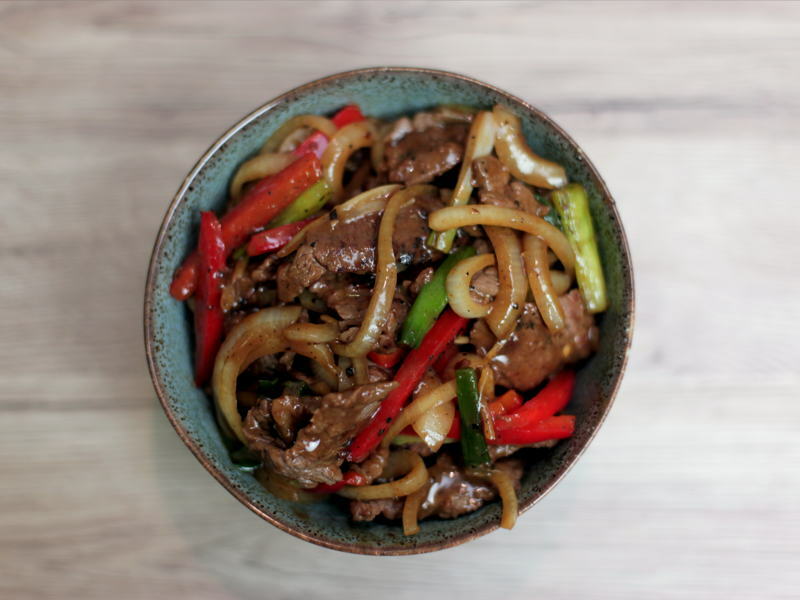 Maintaining the high heat, pour in your sauce, return the meat to the wok and continue to stir-fry for an additional 30 seconds.